In the seven years that I've been crocheting, I've made fifteen blankets using a variety of yarns. I've used pure wool, pure cotton, pure acrylic (if you can call acrylic yarn "pure"?! ), cashmere/merino blends and cotton/acrylic blends. I've used eye wateringly expensive designer yarns as well as cheap and cheerful budget yarns. And without exception, I've always chosen my blanket-making yarns based on their colour credentials. For me to love a yarn enough to use it for blanket making, it has to exist in a range of colours that make my heart happy. The above yarn colours are all Stylecraft Special DK yarn. Since I made my first blanket using this yarn almost five years ago, I have grown to love the glorious range of colours (SiXtY to choose from! ), the durability and washability (essential for camping/outdoor blankets) and the price (unbeatable good value). It also happens to be soft and non-splitty, making it a pleasure to crochet with. Truthfully, it's not my number one most favourite yarn (that spot goes to Debbie Bliss Baby Cashmerino), but really it's a pretty great yarn for blankets. My Little People love them and currently Little Lady and Little B both have Stylecraft ripple blankets on their beds (the Cottage Ripple and the Coast Ripple). But most importantly, when my Stylecraft blankets get dragged across the beach or used to make a den over a picnic table at a camp site, my blood pressure remains stable. They are great family blankets and are much loved and well used here in the Attic. But anyhow, aside from the fibre content and the durability - we need to talk about the sixty colours! In my studio I've got two shelves stuffed with Stylecraft Special DK, that's 55 out of the 60 available shades. The five that are missing from my shelves are :: white and black, plus the three neon shades (fiesta, bright green and jaffa). Last October when I began my Cosy blanket Crochet A Long I hit on the idea of winding lengths of yarn onto wooden clothes pages. I found this a really useful way to plan the random colour stripe order for this blanket, it's much easier to line up 15 pegs than 15 squishy big balls of yarn! However, since then I've used my yarn pegs as a nifty way of creating groups/palettes to inspire future projects. I keep my yarn pegs in a shallow ceramic bowl on my work table and find myself constantly playing with them, trying out ideas and taking photographs, creating little visual "colour notes" to be stored away for future reference. Vintage kitchen colours, Spring flower colours, Fairground colours, Beach Hut colours, - all sorts of images, memories and emotions can be harnessed and translated into colour palettes. Colour underpins every creative thing that I do, that's for sure. Now then - the title of this post, did you notice that? Did you clock that I am supposed to be talking about a Colourful Competition? I've been bursting to tell you about this since last year, so here in a nutshell is the low down - this is a competition organised by Stylecraft Yarns in conjunction with Lets Knit magazine. The idea is that Stylecraft are asking yarn lovers to help them choose the next new shade for their Stylecraft Special DK range. Entering couldn’t be easier - all you need to do is send a sample of your favourite colour to Stylecraft by 31st March 2015. The sample can be anything at all - photographs, pieces of fabric, scraps of paper, a sweet wrapper, a postcard, a child's toy, a sock - all acceptable forms of entry! Stylecraft will be able to accurately replicate the winning colour using an amazing gizzmo that analyses colour and produces high tech info to enable accurate reproduction. What do you think? Does this sound like fun or what?! In April, a panel of judges (of which I am one) will work with the Stylecraft team to select a shortlist of 10 colours, which will then be put to a public vote. The new colour will be launched in October at the Autumn Knitting and Stitching Show in London, and the winner will also receive a whopping 100 balls of Special DK to add to their stash (yes, One HUNDRED squishy, colourful balls!) The 9 shortlisted shades will also receive a superb Stylecraft goodie bag containing a key ring, a new fringed shade card and 5 balls of Special DK. 1. If you aren't already familiar with the complete range of Stylecraft Special DK, you will need to have a good look at the sixty colours that already exist in order to decide which colour might make a good addition. The very best way to do this is to locate your Local Yarn Shop to have a look at real yarn balls (a list of stockists can be found here). Wool Warehouse also go to a great deal of trouble to photograph their yarn colours accurately and their listing of Stylecraft Special colours gives a great on on-screen representation. I am very excited to be involved with this competition, I can't wait to see what you come up with. Wishing you lots (and lots) of colour-filled inspiration, here's hoping your yarny colour-wishes come true! Hi Lucy, i very much enjoyed your blog and came upon it while trying to find a way to display my yarns for samples and color planning. Your simple method of using cloth pins is perfect for me. Thanks for sharing. Thank you for the idea of the pegs. I've just done it for my favourite wool - Debbie Bliss Baby Cashmerino. What are your favourite colours in this wool as I see you have used them. You had a pile of them but you didn't list the colours. I'd love to know! Thank you so much, you are my inspiration! Thank you so much Lucy for sharing your yarn pegs idea. It makes it so easy to play with colour and work out which colour to put next to which. I love colour as much as you do and playing about with combinations is my favourite part. Love your blog! Please blog about your holiday that you mentioned yesterday. I don't crochet, but have told many that do, about your wonderful blog! Yay, this is great! I'm definitely giving it a try! Can anyone tell me whether it is allowed to send in more than one colour? Good luck everyone! This is exciting! 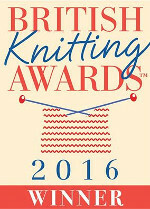 only reason I haven't entered is there's not a nearby store where I can see this wonderful yarn "in person". Colors online are not always "true" in my experience. To those who've said you can't get Stylecraft DK in the US: Good News! Ta Dah! Look for Deramore's - at top of page you can click on link for US (and others as well.) - which I've done. I ordered way too much but it is, Sheila, a lovely yarn. If you didn't like it, WHY did you keep working with it? Have you washed your blanket yet? As a child, I was taught, "if you can't say something nice, say NOTHING!" Many, many knitters - and Crocheters - LOVE, LOVE, LOVE Stylecraft DK. Do NOT ever 'attack' our Dear Lucy! There are way too many of us who love her dearly! and from other comments, I do believe WE who LOVE LUCY are in the VAST majority here! Oooh what an exciting opportunity! I actually got the chance to have a tour of the Stylecraft Spa Mill in November as part of my degree course - it was knitter's heaven! You have reminded me of the crochet l did of a bedspread.I started making a 6 ins square in two rows then changed colour and kept going round it in a big square till the bottom took one ball to made the edge in one colour row.A very heavy bedspread but it kept us warm. Thank you Arlene Bomback for this helpful information. I appreciate that you took the time to let me know this. I'm going to check this out. Wonderful idea! I will be looking through my pics tonight for inspiration! Great contest - can people in the U.S. participate? Just to say Thank you Lucy. I learnt to crochet a year ago and your blog was the first I discovered. I was very much a 'careful' colour person when I set out on my crochet journey but am now thrilled to be experimenting with colour, largely due to your influence. Already made 3 blankets, countless bags, hats, 3 ponchos and currently working on 3 different CALs, so I guess you could say I'm well and truly hooked! Geri McComb just order it on line. the postage isn't that much. I order it from Tasmania....it's very exciting when the parcel arrives!!! Lucy,I Love your blog. Its so hard when I would love to buy the yarn in all those colors and its not being sold in the to the U.S. I would be able to make a ripple blanket for my Great granddaughter with the correct colors in my opinion. I hope someday it will be. Also its there a pattern for the cute lamp shade pictured in your blob. Thank You Geri. Hi Barb, I have not been able to locate this yarn is Canada or US so I have ordered from Wool warehouse (listed in Lucy's blog) and at Loveknitting.com who offers free shipping. Good luck sourcing out this colorful yarn. Yippee!!! I am so thrilled that the competition is open worldwide! Thank you so much Stylecraft! Thanks so much Lucy! I love your blog. What a fun contest - the more choice of color the better. One question - is Stylecraft DK yarn available in the US? And by the way, I LOVE your blog! I love just how colorful it is and thank you for sharing your talent, imagination and charming creativity with us. Pure Joy!! On the other hand perhaps Stylecraft could partship 10 at a time. Sheila I know you! You are the bitter old mother in law that everybody hopes won't visit because she robs the joy from your very soul with every word. It doesn't matter what Lucy says, for you will always twist it to suit your own negative assault on her blog. I sincerely pray that you aren't so horrible to real people in your life or you truly must be very lonely. Your previous comments are telling Lucy off for "pushing" Stylecraft yarns and this comment you attack her for calling it "second best", admitting that you actually use it. I would have blocked your comments long before now but Lucy is a gracious lady. I'm sure you yourself have snidely remarked to many people to stay silent if you have nothing nice to say. You should try that. Long live Stylecraft, long live Yarndale and long live Lucy in her colourful, blanket filled attic!